For as long as sports have been played, players and teams have sought a leg up on their opposition. Some tactics have been purely gamesmanship, others less than legal. Disguising the status of injured players is only one of a litany of developments in the never-ending game of smoke and mirrors that opposing teams play. The National Football League, and football as a whole, has been no stranger to this chess match. The NFL began its injury reports in 1947, but only to prevent gamblers from approaching players, not to prevent teams from jockeying with one another. Seemingly every season, the Super Bowl features at least one major player who is injured in the run-up to the game and whose status is up in the air. Recent examples include Colts’ defensive end Dwight Freeney’s ankle injury prior to Super Bowl XLIV, Rob Gronkowski’s ankle before Super Bowl XLVI and Tom Brady’s hand this year. Freeney had Indy’s only sack of Drew Brees in Super Bowl XLIV; Gronkowski was limited to only two catches against the New York Giants and Brady broke the record for passing yards in a Super Bowl with a purported hand injury that was more suspense than substance. The Patriots final injury report in advance of their loss to the Eagles was barren. In spite of this, the media machine made sure to talk up Brady’s hand injury, and NBC made sure to snap a picture of the injured hand as soon as humanly possible. The common denominator among all of these injuries is the mind tricks opposing coaches attempt to play with one another. Everyone knew Brady would play in the Super Bowl, but Freeney and Gronkowski were more uncertain. It all boils down to forcing the team on the other side to devote assets to game planning for these playmakers. Downplaying, clouding or downright fabricating a player’s status is another part of the game in the NFL. Listing a player as “doubtful” or “questionable” rather than “out” forces opponents to study and scrutinize the game-changers across the line. Freeney rolled up 13.5 sacks in the 2009 season, and Gronkowski had 17 touchdowns in his sophomore season. Both were matchup nightmares. The NFL heralds its injury reporting guidelines as essential to upholding the public’s trust in the sport. While that all may be true, the injury report has become another tool in coaches’ arsenals for winning games. The concussion protocol, established in 2009, adds a further wrinkle to the injury status game. Anything that can be done to make a player’s status hazier, the better. North Dakota State head coach Chris Klieman utilized this tactic in the FCS Championship game against James Madison. 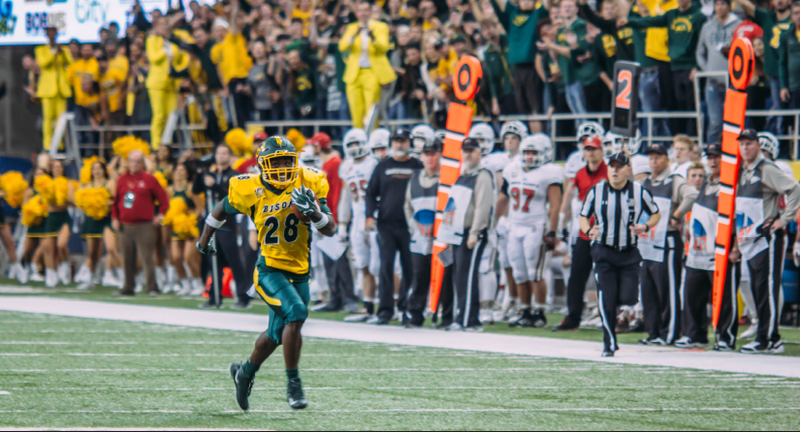 Sophomore running back Ty Brooks injured his shoulder in the Bison’s semifinal game against Sam Houston State. Brooks later required surgery and was in no position to play in NDSU’s championship win. In spite of this knowledge, Klieman never indicated whether or not Brooks — or injured cornerbacks Jalen Allison or Jaylaan Wimbush for that matter — would suit up. Afterward, when asked what the status of the players was, Klieman tipped his hand. “Ty had surgery a couple weeks ago. I can’t believe you didn’t call Sanford Hospital and figure that out, but that’s on you. Ty had surgery two weeks ago; I think before Christmas,” he said slyly. Brooks, who Klieman called one of the most electrifying backs in all of FCS, would dizzy JMU’s coaches attempting to halt him. Unsure of his status, Dukes coaches and players had to be prepared. The gridiron has always been a battlefield measured in yards but determined in inches. Any extra inch coaches can gain from sideline and media artifice, they will take.